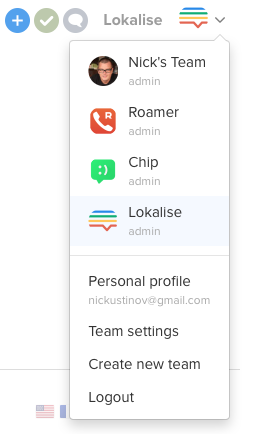 Learn how teams and subscriptions are organised in Lokalise. Users and projects are organized to teams. Any user can be a member of one or several teams. You can switch teams any time by clicking a team logo in the top right corner and choosing another team. Each team requires a separate subscription. Projects belong to teams. If you would like to transfer the project to a different team, make sure you are added as admin to the project and as admin in both teams, then navigate to the project settings and change Belongs to team setting. Navigate to Team settings to manage team roles. Each team can have one or several owners with equal rights. Team members are usually translators with a limited access to the projects. Any admin can subscribe to a plan to become biller. If there is a biller already, and another team member subscribes to a plan, previous biller's subscription plan is cancelled and new plan becomes active immediately. Credit card icon is displayed next to billers e-mail in the team settings.